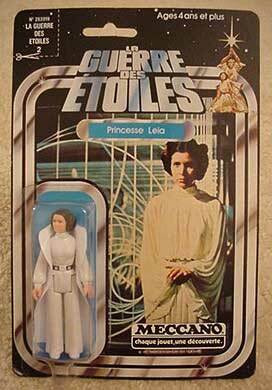 French Meccano Leia, on Large 12-Back Card: While Meccano switched to small, squarish blister cards later in the line, the first Star Wars blister cards issued by the French toy licensee were similar in size to their U.S. counterparts. Here you see a very rare example of one of these early-issue cards. Notice the text located at the top left, instructing the consumer to clip off the corner for use as a proof-of-puchase. The back is vaguely similar to the U.S. 12-Back. 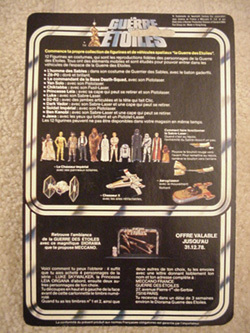 However, in place of the ad for the 12 figure mail-away stand that appears at the bottom of the Kenner cards, the Meccano version advertises a cardboard stand that looks very similar to the one issued by Kenner in their Early Bird envelope. Here you see a closeup of the cardboard stand. If this was actually released, I've never seen proof of it.